Is The 2017 Maserati Quattroporte Finally A Proper Italian Luxury Car? Some minor updates have fixed a few of the car's faults. was released in 2013. Just three years later and Maserati has decided to give the car a refresh. Like the Ghibli, , but this 2017 refresh might solve a few of them. The exterior features very minor changes, including new bumpers with an electronically adjustable air shutter in the front grille. This gives the Quattroporte better control over the engine's fluid temperatures. The interior is where the 2017 Quattroporte really improves. For a car costing over $100,000, we thought it was a bit strange that the interior looked a bit like a Chrysler product. New climate controls and an 8.4-inch infotainment screen now look like they belong in such an expensive car. The 8.4-inch screen is still the same unit as you would find in Dodge and Chrysler products, but Maserati has given it the aesthetic makeover that it should have had in the first place. The system has also been improved with Apple CarPlay and Android Auto. The interior of the Quattroporte has also been given a new Air Quality Sensor that helps calculate pollution levels inside the vehicle and protect occupants. A new driver assistance package also includes systems like adaptive cruise control. 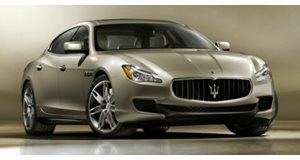 V6 Quattroporte models can be upgraded with new GranLusso or GranSport trims. GranLusso models feature different bumpers and interior combinations to create a luxury feel while GranSport trims feature exactly what you would expect, sportier trim. The GranSport has a lower front fascia, red brake calipers, 21-inch wheels, and sporty touches like new seats and a sportier steering wheel. All V8 GTS models will come with GranLusso or GranSport upgrades as standard. Engine options will remain the same as 2016 models with V6 and V8 offerings.